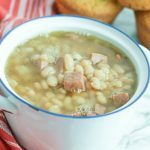 Ham and Bean Soup in the Instant Pot is an easy dinner and packed full of goodness. This is also a great Weight Watchers soup recipe! Using the saute setting on your instant pot, heat olive oil. Add onion and garlic and cook until translucent. Hit cancel on your instant pot to stop sautéing, then add beans, ham, pepper, parsley and salt. Add chicken stock and water. Stir until all ingredients are combined. Place lid on the instant pot and set to high pressure for 40 minutes. The pot will take around 20 minutes to pressurize before cooking. Do a quick release when the recipe is finished cooking, which will take around 10 minutes. This recipe makes approximately 5 cups. Each serving is one cup. If you are following Weight Watchers this recipe is 3 Freestyle SmartPoints per serving.